Comments: Yellow-billed Loons are the largest of the loons. Similar in breeding plumage to Common Loons, their heavy bill is yellow in all seasons and slightly angled upward. Along with the tendency to keep their head raised, Yellow-billed Loons have a unique silhouette. In nonbreeding plumage they do not have the jagged neck pattern of white on dark seen on Common Loons. 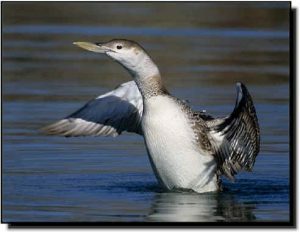 They are heavier and larger than both the Red-throated and Pacific loons and are paler in nonbreeding plumage than either species. Yellow-billed Loons occur in small numbers or are found only in localized sites within the Great Plains.